Choosing attractive colors for your promotional and marketing materials can also help to build your brand recognition, as well as ensure that you're able to make a fast and impactful connection to your target market. But even the colors that you choose to paint the exterior and interior of your office building or store matter. Of course, selecting colors for signage, your office, and much more is easier said than done. You'll need to educate yourself about the role of color psychology in business, and learn more about the kinds of colors that match with your branding and cause an emotional reaction in your customers. In this post, you'll learn everything you need to know about the crucial role that the right color scheme plays in your ability to sell, market your brand, and much more. When you're choosing the best business colors for your brand, you need to start by asking yourself a few important questions. First of all, what is the story that your brand is telling? Think about what made you want to start your company in the first place, as well as the aspects of your business that set you apart from your competitors. Next, consider the values that you want to express to your target market. This also means that you'll need to think about what is important to your market, and the kinds of marketing that they're likely to respond to. Finally, and most importantly, whether you're choosing colors for your storefront signage, your building's exterior, or even the inside wall of your meeting room, think about the emotions that you want people who come into contact with it to feel. This means that you'll need to think about how your color schemes will make both your employees and your potential customers feel. How can your commercial building's paint color divide up your store and help customers to find what they're looking for more quickly? How can it help encourage them to make faster buying decisions? After all, about 90% of buying decisions and the overall impressions a brand makes on customers are directly tied to its color scheme. Now, let's take a look at the emotions that certain colors can create in those who come into contact with them. Whether you're looking to choose the right business color schemes to repaint your building or if you're trying to choose the best background colors for your website, you need to think about the feelings that colors create. To avoid conflicting emotions, making your space look smaller, or muddling your brand message, we urge you to focus on one to two colors in your branding strategy. Additionally, make sure that you keep the colors you've chosen for your branding and commercial buildings consistent with your marketing materials and the other stores and offices that your brand owns. Now, let's take a look at the emotions that specific colors can make. Red creates feelings of intensity and energy, and it's actually been proven to raise blood pressure levels in those who come into contact with it. It's associated with high-pressure sales, but also with romance and love. White is the perfect color for businesses that are focused on minimalism, and who want to create a practical, timeless feel. It can help to keep your space looking clean, and is an excellent choice for those in the medical fields. Yellow is one of the most cheerful colors, perfect for making your clients feel more optimistic. It also may cause them to laugh more, and to feel a sense of warmth when they enter your space. It's a great choice for therapists, clothing boutiques, and even bakeries and restaurants, as it's been known to make people feel hungry. Green is certainly most commonly associated with money and growth, meaning it will continue to remain a popular choice for those in the financial industries. But it also evokes a desire to be out in nature, as well as feelings of calmness and stillness. This means it works well for natural/homeopathic companies, outdoor brands, and even vitamin/supplement stores. It's often associated with health, which also makes it a wonderful color for pharmacies and other medical buildings. 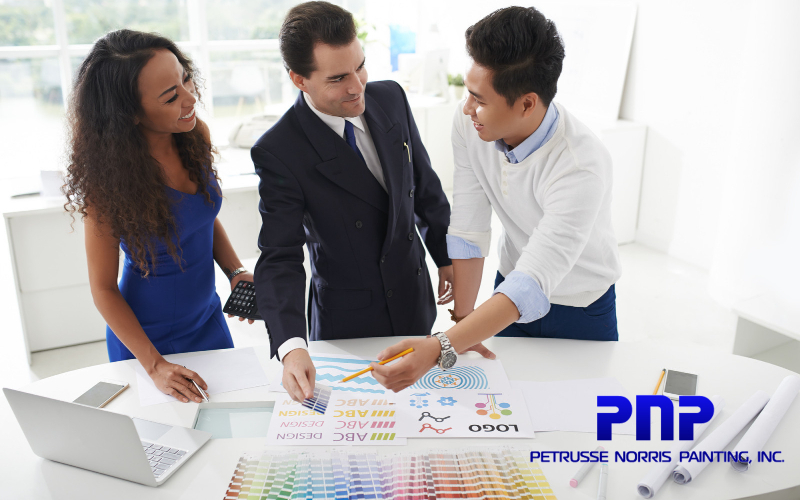 Blue is one of the most common colors for business marketing materials, as well as for painting an office building or store. It's associated with wisdom, truth, and trustworthiness -- so it's easy to see why so many brands want to use it. It also makes people feel a bit more focused, and can even instill feelings of loyalty in people who come into contact with it. This is why it's also one of the most versatile marketing colors out there today. Orange is often associated with excitement and energy, and even feelings of wanderlust and vacation. It also signals change, making it a wise choice for travel companies and gym-based businesses. Looking for an Experienced Commercial Painting Service? We hope that this post has helped you to better understand the emotional impact that choosing the right business color schemes can have on your target market, your team members, and even those just walking by your building. Additionally, remember that your color scheme is a huge part of your overall branding strategy. Are you ready to connect with expert commercial painting services that can help your business to grow and ensure that customers can immediately recognize your brand and its marketing materials? If so, then get in touch with us today for a free estimate. We can't wait to help you improve your reputation and generate buzz by giving your space the makeover it deserves.